Josie Brown HSDAD, Cert Ed., MIfL, is a professional calligrapher and heraldic artist, carrying out commissions for the private, academic and military sectors. She enjoys taking natural materials together with ancient techniques and using them in a contemporary manner. She also has a particular passion for gilding using historic and modern, Western and Middle Eastern methods. Commissions undertaken include Freedom scrolls, Resolutions of Thanks, Honorary Alderman Book entries, family trees, retirement and illuminated addresses, certificates and wedding poems and stationery. 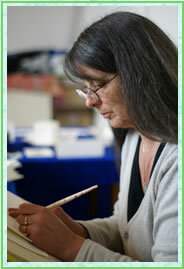 Josie has project managed various creative ventures, liaising with clients, binders, conservationists and/or printers. She has experience of carrying out physically large pieces of work such as the Rothschild Houses hanging, which is 6½ feet high, while the University of Gloucestershire Timeline is almost 7ft wide and consists of 3 large vellum skins joined together. Teaching has always been an important feature of Josie’s work. She teaches in several curriculum areas as well as the arts, and trains teachers in adult education to the required qualifications. Josie is dedicated to facilitating fully inclusive learning and enabling students to reach their full potential.